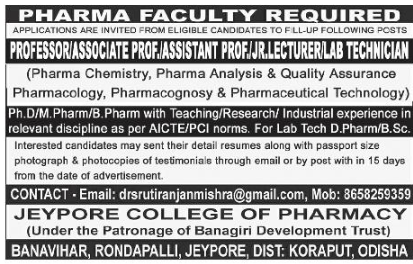 Jeypore College of Pharmacy, Koraput has advertised in Samaja for the recruitment of Professor/Associate Professor/Assistant Professor jobs vacancies. Interested and eligible job aspirants are requested to apply with in 15 days. Check out further more details below. About College: The Jeypore College of Pharmacy founded in the year 2000, has today grown to become one of the forefront educational institutes in KBK District. Jeypore College of Pharmacy started in the year 2001. The institute is managed by Banagiri Development Trust. It is teeming with academic research, medicinal garden, canteen, play ground and personal development activities.